This section will help you learn Japanese online with intermediate Japanese lessons. If you have not gone through the basic Japanese lessons yet, please go through them first before continuing on the lessons here. You may also want to increase your words and vocabulary in Japanese on various topics. If you have completed the basic lessons, congratulation! You are about to explore further with more interesting topics in the coming lessons. By nature, human being tends to get bored on things after some time, unless on things that he or she has real interest. If you have studied and completed the basic lessons and are still craving for more to learn Japanese online, it's a sign that you are really passionate about learning the Japanese language. Well, some people will still quit after they realize that there is still a tremendous amount of new Japanese grammars that they need to learn subsequently. But I do hope that you can continue the learning journey, no matter what is the motive that sparked your interest to learn Japanese online here. Let me suggest a way that may make you press on your Japanese learning adventure. Think of it as acquiring a set of new skill that may help you in one way or other, either in your work or other areas. As language does not become obsolete like technology, you will definitely appreciate having known another language. OK, enough 'preaching'. Let's work hard together for next series of Japanese lessons. Japanese grammar plays an important role in learning Japanese. You will understand sentences quickly if you have a good foundation of grammar. Besides, grammar constitues part of the test in JLPT. 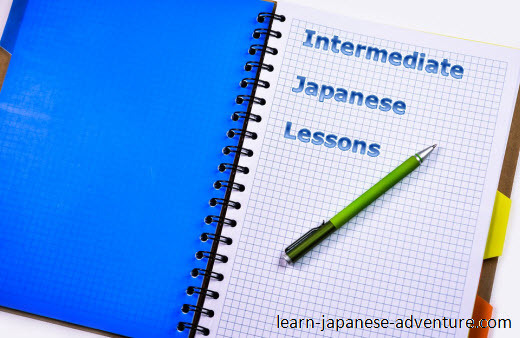 In these intermediate Japanese lessons, I will concentrate on introducing more Japanese grammars, expressions that you are required to know to learn Japanese online. What is the expression in Japanese when you desire something or you want to do something? In this lesson, you are going to learn two expressions that indicate your desire for something (noun) and desire to do something (verb). Learn this important Japanese grammar た-form ことがある/あります (ta-form koto ga aru/arimasu) to express your experience or what you have done in the past. Learn how to make your Japanese sentence sounds more natural by using Plain form のです (Plain form no desu) which used by the native frequently. Japanese grammar ための (tame no)/ために (tame ni) describes the benefit/purpose of something or doing some action. It's used frequently. How to use Japanese potential form 可能形 (kanoukei) and できる (dekiru) to express ability or possibility to do something? Learn how to use ようになる (you ni naru) to express change in habitual action or change in ability/possibility. Learn Japanese online - かどうか ka dou ka, which means "whether or not" in English, combines two sentences into one. Study the two Japanese expressions - だけ dake and しか shika which used to describe the meaning of 'only', 'just' or 'merely'. Get familiar with the Japanese grammar to express intention - つもり tsumori and volitional-form 意向形 (ikoukei). Learn also how to change dictionary-form to volitional-form. Use this Japanese expression そうです (sou desu) to convey what you have obtained from another information source, without including you own opinion. Learn these two Japanese expressions でしょう (deshou) and かもしれません kamoshiremasen) to express your guess or judgement about something. Japanese verb te-form is used to form many of the Japanese grammars. You will learn Verb(て-form) みます, Verb1 (て-form) Verb2 and Verb1 (ない-form)で Verb2 here. Learn how to use toki in Japanese and what are the meanings when different forms of verbs, い-adjectives, な-adjectives and nouns are connected to it. Japanese particle ga (が) is sometimes used as an introduction before you bring out the actual thing you want to say. Learn the Japanese grammar for permission and prohibition, how to grant permission, deny permission and express prohibition to do something. Study how to use the Japanese grammar for obligation, the difference between ～なければいけません (~nakereba ikemasen) and ～なければなりません (~nakereba narimasen). Learn how to form Japanese sentence using the emphasize structure to stress on the topic you want to know most between のは (nowa) and です (desu). Japanese particle de (で) is used to show if something is alright. It's also used to show the age when something happened. Learn another Japanese expression そうです (sou desu), also known as 目の"そう" (me no "sou"), to make a guess that "It looks like ~" by judging the appearance of a thing. Understand the Japanese grammar ので (node) for cause and reason. Know the differences between ので (node) and から (kara) and when to use each of them. Learn some Japanese expressions that are commonly used to compare two items, using words like より (yori) and のほうが (no hou ga). Japanese grammar shite imasu (しています) can also mean 'has got' or 'possess' which is used to emphasize the description of appearance or shape. Learn to use Japanese expression ようです(you desu) to indicate your judgement based on what you have read, heard or been told. Japanese conditional form と (to) sentence is mainly used in 3 types of sentences: nature-related fact, use of machine, give direction. Japanese conditional form ても (temo) sentence is used when the opposite result happens (or opposite action is taken) to what people normally expected. Japanese conditional form ば (ba) / なら (nara) sentence is less strict than と (to) sentence, but it still need to fulfill one regulation. Japanese conditional form たら (tara) sentence has no regulation. You need to look at the conversational aspect when the sentence made using all 3 conditional forms are grammatically correct. There are 2 special cases where たら (tara) sentence has to be used even though grammatically you can also use ば (ba) / なら (nara) sentence. Learn how to construct sentences using すぎる sugiru or すぎます sugimasu to indicate that the degree of an action or a state is excessive. Learn how to give suggestions or advice using the Japanese expression ～ほうがいいです (~hou ga ii desu). Learn to use Japanese grammar くします (ku shimasu) and にします (ni shimasu) to 'make' something into a certain condition or state. Learn Japanese demonstrative expression using そ (so) and あ (a) to refer to something that was mentioned in previous sentences. Another function of たら (tara) sentence is the discovery of surprised or unexpected events after actions done in the past. Japanese particle de (で) is sometimes used to indicate the cause or reason of an uncontrollable event. Learn how to use te-form of Verbs or Adjectives as the cause or reason that produces a consequence. The consequence can be an emotional feeling or a state. noni (のに) is used when what is stated in the second sentence runs contrary to what is expected from the first sentence. It delivers speaker's surprising or unsatisfied feeling. ～てあげる (~te ageru), ～てもらう (~te morau), ～てくれる (~te kureru). Learn ～てあげる (~te ageru) ～てもらう (~te morau) ～てくれる (~te kureru) with many examples to show how giving and receiving of "actions" works. Learn also what particles are used in those examples. In the basic Japanese lessons section there are more lessons for you to learn Japanese online.